With a low glycemic index oatmeal is assimilated slowly, keeping sugar levels stable. Oatmeal is thought to increase milk levels for breastfeeding mothers. Insoluble fiber’s cancer-fighting properties are due to the fact that it attacks certain bile acids, reducing their toxicity. Oats are a good source of many nutrients including vitamin E, zinc, selenium, copper, iron, manganese and magnesium. Oats are also a good source of protein. There are so many ways to prepare your bowl of oatmeal…but my favorite way is to turn it into a “power breakfast” with lots of embellishments. Oatmeal has never tasted so good! Here is the buffet of deliciousness that I put out for toppings…and yes, I add ALL of them! I used to put brown sugar on top…but realized that I was completely wrecking the nutritional value by putting that on. Brown sugar is just white processed sugar that has been colored brown…don’t be deceived 🙂 Agave or stevia are much better choices. Of course, no sweetener would be even better…and by adding bananas, you can do that. They’re so sweet! Adding all of these nutritional powerhouses turn your regular ‘ol oatmeal into an amazing treat! Entry filed under: Breakfast, Oats. Hey there! We just made a delicious vegan oatmeal this week. Now I think I need to add some of your ideas to the menu! Do you soak your oats overnight or make them on the stove? I have tried soaking and it isn’t my favorite. Maybe with all this good stuff on top I will try again. thanks for the ideas! i was eating some hot flaxseed cereal the other morning and it was good, but a little blah… 🙂 i’ll have to try throwing some of these things on it! 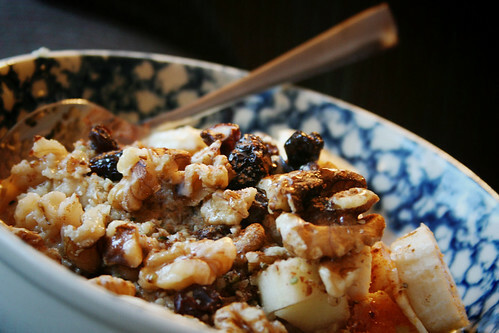 i don’t know why i never thought of apples in hot cereal… mmm! Deanna…I don’t soak them, but I’ve never tried them that way. I figure since they are already a “dead” food (heated in processing)…what good could soaking do? What has your research told you? I do LOVE to eat oats without any cooking…more like a muesli. It’s SO delicious!! Kristin…yes, try adding some of these things and you’ll be hooked! Hi there! Looks yummy. I just have a comment though–I think that while many grocery store brands of brown sugar is white sugar sprayed with molasses, there ARE a few brands that are unprocessed cane sugar with the natural molasses (and it’s minerals) retained. Oh Sara have you ever tried Baked Oatmeal?? Oh my so good. All recipes.com has several. The one I use has like 127 positive reviews. I also tweak it around a bit with what I have on hand. Also thanks for the info on agave. Just started with it and yum! Actually, I just made some a few days ago…and it drove me CRAZY waiting for them to be done! 🙂 It took about 30 minutes (as opposed to 5 minutes with traditional). I get kind of impatient in the morning waiting for my breakfast…especially with a 3 year old constantly asking if it’s done yet 🙂 I do like the texture though…it’s very chewy and nice. I’ve seen a couple brands that don’t require as much time. I’ll give them another chance just for you…and I’ll get up earlier to make them 😉 Thanks! If you want to cool down Bella’s bowl of oatmeal, sprinkle some frozen wild blueberries…they instantly defrost and cool down the oatmeal!! Looks great! I love my oatmeal with bananas too. If you do decide to try steel cut oatmeal again, you can make it in a crock pot overnight. Then your breakfast is warm and toasty and waiting for you when you wake up. And your home will smell amazing! I often make a big batch on the stove top on the weekends and put the leftovers in the refrigerator for my daughter’s breakfasts during the week. Just add a bit of milk or other liquid and they reheat beautifully. Most are, but the organic versions have LESS THAN 1% oil just to keep them separated. It’s a very tiny, and even healthy amount :All oils are not bad…just “bad” oils are bad. Shannon…you’re so cute 🙂 I know I don’t HAVE to try them. I sound the same way when I’m talking about food! I have a crockpot oatmeal recipe on this blog…I will have to try it with those. Great idea!